How Can PT Help My Carpal Tunnel Syndrome? The carpal tunnel is the space formed by the bones of the wrist and hand that allows passage of the median nerve along with tendons of muscles that move the joints of the hand. This space is typically about an inch wide, however it can be made narrower in the presence of irritation and swelling of any of these structures. Narrowing of this passageway can lead to pressure on the median nerve, which may lead to symptoms such as tingling, burning, weakness, and pain in the hand and fingers. How do I know it is carpal tunnel syndrome? Symptoms from carpal tunnel syndrome such as numbness and tingling typically present themselves at the thumb, index finger, middle finger, and half of the ring finger. This is because sensation to these areas is supplied by the median nerve. If the median nerve is being compressed, these areas may become numb or painful. You may also find weakness of the muscles that move the thumb, first two fingers, and wrist. The picture below shows what the hand may look like when a person with long-standing carpal tunnel syndrome attempts to make a fist. 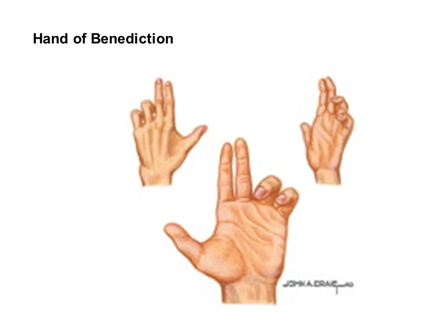 It is known as the “Hand of Benediction Sign”. What is the traditional treatment for carpal tunnel? Typically, people suffering with the symptoms of carpal tunnel syndrome receive anti-inflammatory medications or are suggested to have surgery. This surgery involves a “release” of the transverse carpal ligament, meaning that the surgeon cuts this ligament to help decrease pressure on the tunnel and, therefore, the median nerve. The issue is that this does not always solve the problem. If the tendons are still inflamed and swollen, we may still be feeling these symptoms after the post-surgical healing process is complete. For this reason, physical therapy should be a patient’s first option. Many people find that PT alone helps them return to normal, pain-free functioning during daily tasks. How do we improve these symptoms in PT? The symptoms from carpal tunnel syndrome can be resolved by decreasing pressure on the median nerve at the level of the wrist and hand. This can be accomplished by improving flexibility of the muscles and connective tissues at the wrist and hand, especially those on the front of the forearm. Your physical therapist will perform mobilization and stretching techniques, postural training and education, nerve gliding techniques, and soft tissue mobilization. Once the tissues are of proper flexibility, we must ensure that the muscles surrounding the hand and wrist are strong to help stabilize the joints. A home exercise program with specific exercises to help your condition will also be prescribed. Newer PostWhat is the Rotator Cuff and What Does It Do? Older PostHow Can PT Help My Spinal Stenosis?